This year’s poster is unique in that it combines the work of two of our wonderful artists. Photographer Leah Hedberg captured the color and artistry of Beth Poirier’s intricate weavings. The 2013 poster will start going up around the Gorge soon, so keep a lookout. For a glimpse of the chosen photo, take a look at our website’s header. Leah Hedberg is a Hood River, Oregon artist focusing on commercial and fine art photography. Having lived in Hood River for the past 13 years, Leah has special interest in fruit portraiture, culinary photography, and fine art still life. Her artistic vision is informed by a love of poetry and music, and is inspired by a sense of curiosity that keeps her looking closely at everyday subjects. She finds her escape in art, where searching in ordinary places often reveals something extraordinary. Leah studied photography at Northern Arizona University. Her art has been shown in juried exhibitions and is currently available at Columbia Art Gallery and at Mt. Hood Winery in Hood River. Beth Porier began weaving in 1981 while living in Ketchikan, Alaska. After moving to Sherwood, Oregon in 1984, she studied weaving and art at the Oregon College of Art and Craft and Marylhurst College and has focused on towels and table linens since 1991. In 2005, she moved to Goldendale, Washington. She is currently living temporarily on Vancouver Island with her dad and using this time away from the usual studio environment to experiment with new techniques and materials. In Goldendale, she has an invaluable assistant, Pam Forbes, who assists with weaving and finishing work. In addition to her towels and table linens, she weaves her designs in a wearable form – scarves – using bamboo, silk, and other natural fibers. Weaving is endlessly intriguing for her – the textures of yarns and cloth, the colors, and the endless variations that are possible. She was drawn to textiles from a very early age when she was growing up in Nova Scotia and watching her grandmother with her needlework. A penchant for weaving runs in the family: her French-Canadian great-grandmother was a weaver and her son continues the tradition, having apprenticed with her several years ago. Thank you so much to both our poster artists. See you at the festival! The 2013 Artist Application is here! Finally, you say! But better late than never. Here it is the 2013 Artist’s Application, and we can’t wait to see your submissions! We are planning for a wonderful festival in a great new location. Please note that the applications are due April 9, 2013. 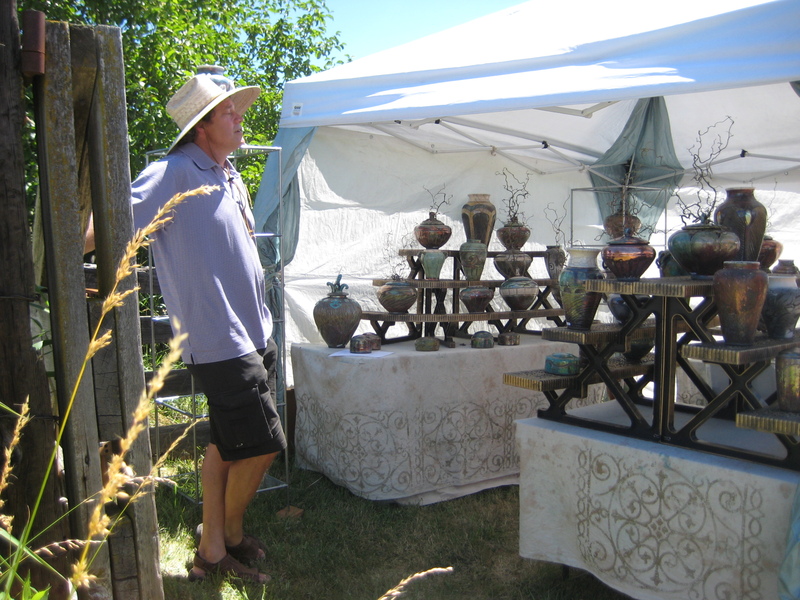 Scott Gray’s unique pottery is featured on our poster and will be attending the festival this year. Check out a couple more images of his work. The Artist List for the 2012 Trout Lake Festival of the Arts has been posted. Please check out the folks who will be attending this year. Some really great returning artists and several new faces as well. 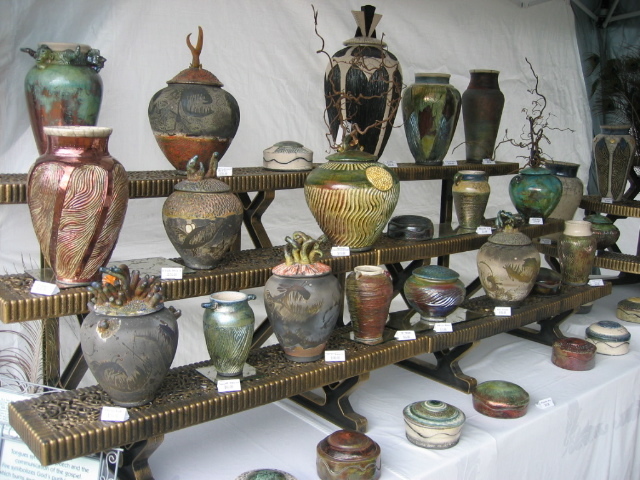 The applcation for the 2012 Trout Lake Festival of the Arts is available now. Deadline March 31, 2012. Click here for details. This year’s concert features Richard Tillinghast and Tova Cochrane. Saturday, 6:30 – 8:00 p.m. Bring a picnic and a blanket. Desserts and drinks will be available for purchase. Thanks TLBA for making the generous donation that makes this evening possible. The list of the 2011 participating artists is up so check it out.